Home Articles Stress – therapy’s worst enemy? Most people in the industrialized parts of the world encounter stress as part of their daily life. Looking through Danish newspapers from the past couple of months hardly a single issue has arrived in the mailbox without an article about stress. In the USA the National Safety Council estimates, that every day one million Americans are absent from work because of stress. This costs society an impressive 150 billion dollars a year. The past decade has seen a veritable boom in consultants and therapists offering advice to stressed individuals. ”Stress management” has become an integral part of a modern vocabulary. Reflexologists have an important role to play in this development. We posses excellent tools to help people reduce their stress levels. First of all, the fact that we are working on the feet helps our clients in returning to a state of feeling connected to the roots – they are being grounded. This may sound – and is indeed – very simple, but none the less comprises an important first step in reducing stress. In our experience it is a good idea to ask stressed clients to focus on the body and especially the feet during the treatment. Ask them to ”leave the head” and stop thinking. That our energy fields are highly influenced by our thoughts and concentration has been scientifically validated by many researchers. We find that the therapeutic outcome is greatly enhanced when we include clients in the practical work by asking them to focus their attention as well as intention on the client-therapist interplay and allow themselves to feel their energy fields both inside and around the physical body. In our opinion the session will be more efficient if clients don’t fall asleep; the energy of their consciousness strengthen the healing power. Many people believe stress is an entirely psychological phenomena, and are surprised to learn that it also has to do with body chemistry. The physiological side of stress is governed by the autonomous nervous system and the hormones adrenaline and cortisol. If we encounter stress for a prolonged period of time - and feel like chronically haunted prey - we will end up in a state of exhaustion. The bodily systems can not keep up the high pace and the stress hormone cortisol looses its effect after about one hour and begins to inhibit our immune system and many other processes. If the stressful situation continues some people suffer a complete break down, where it often takes months for symptoms to disappear. Memory loss is common and may last up to one year, because the nerve cells in the brain are recovering slowly. As the autonomic nervous system (ANS) plays such an important role in stress, we will look at ways to address this system with reflexology techniques. The ANS is the unconscious part of our nervous system consisting of two parts: The sympathetic and the parasympathetic nervous systems. These two halfs play opposite roles and a proper balance between them is crucial for normal bodily functioning. The sympathetic part is active when we are burning energy, the ”fight or flight” response. The parasympathetic system on the other hand is responsible for restoring our depots, digestion, repair processes and reproduction. In a state of stress the seesaw has tipped to the sympathetic side, with too much activity going on in this system. This is the physiological side of stress. Looking at the anatomical layout of the ANS (Figure 1) pay special attention to the origin of the two parts in the brain stem and spinal chord. 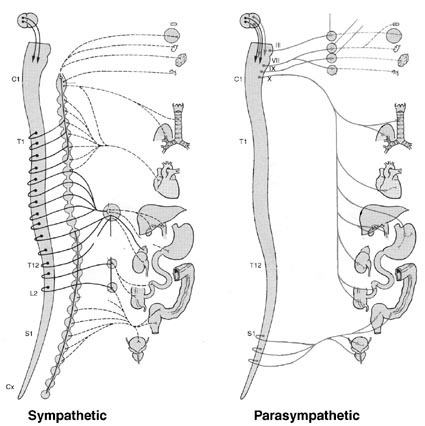 The sympathetic nerve cells are found in the spinal chord between thoracic 1 and lumbar 2, whereas the parasympathetic has its origin in the brainstem and in the sacrum between sacral 2 and 4. Reflected to the feet these are the same areas we use for treating the ANS. Besides innervating the organs as shown, the sympathetic nervous system sends nerve fibers to the smooth muscle cells in all arteries and arterioles. This is how blood flow to the various parts of the body is being controlled, and this is also the mechanism behind symptoms such as stiff, painful muscles and other signs from the musculo-skeletal system often seen with stressed persons. These reflexes are located on the plantar aspect of the feet and since we are dealing with central structures of the nervous system, we work on the bony structures of the feet. 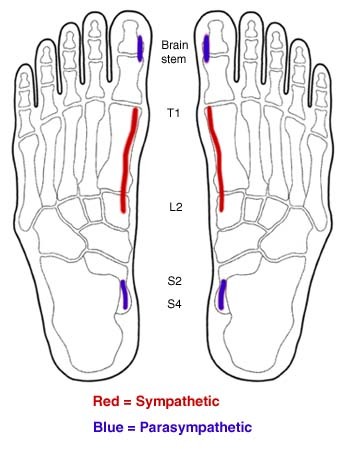 Figure 2 shows how the sympathetic reflexes are located along the first metatarsal and on to the first cuneiform bone. The parasympathetic reflexes have two parts, one in the brainstem corresponding to the distal phalanx of the great toe reaching across the joint with the proximal phalanx. The other in the sacral part of the spinal chord, which is found on the talus just below the medial malleolus. One efficient way of working these reflexes against the bone, is to place the thumb flat from medial against the bone, and then swing it around toward the plantar side, thus gently pushing away the soft tissue and getting the clear contact with the bony surface (see figure 3). When working these areas you could use classical reflexology techniques to work through both sympathetic and parasympathetic and then let the body do the rebalancing of the systems. Or if you prefer, you could think in terms of stimulation and sedation. In stress situations it would be beneficial to stimulate the parasympathetic side and relax the overloaded sympathetic branch. A good relaxation technique is shown in figure 4, where you cover the entire reflex with both thumbs. Use a very gentle touch and just sit for a while holding the area and letting the energies flow. Most clients find this grip very relaxing and comfortable. Allow some time and find a comfortable position yourself, remember the client is never more relaxed than the therapist! Stress – therapy’s worst enemy! With a stressed out client, you may apply the finest of reflexology’s techniques performed with the best of intentions, but chances are high that the efforts will be wasted, because the stressed body is a very poor “listener”. Reflexology supports the self healing abilities of the client, but these systems have been turned down to a minimum in the stressed state. Therefore it is crucial to start the sessions with techniques that may reduce the stress level and get the parasympathetic nervous system going again. Before they lay down on the massage table or in the treatment chair, ask them to stand with slightly bent knees and shake the whole body, make them ”shake the stress out of the body”. This is exactly the instinctive reaction of animals in the wild, when they have survived an attack. Human beings still have this inborn instinct, but due to cultural codes of behavior we don’t allow ourselves to use it any longer. If possible, let clients talk about their stress. Stress advice no. 1: Talk to others about it! Then ask them to try and ”leave the head” to focus on their bodies. Ask them to register sensations in the feet and the rest of the body. Start out the treatment by working the autonomous nervous system. In very stressed individuals try the relaxation technique shown above. Another way of helping stressed clients could be to inform them about the world wide growing “Slow movement”. This is a decentralized grass root movement promoting down shifting life, emphasizing things that take time. A major inspirator for this movement has been Canadian Carl Honoré and his book “In Praise of Slow” which has been translated into 26 languages. The slow movement is spanning many fields and many different people from cooks advocating “slow food” to corporate executives of IBM instructing employees to only check their emails twice a day. In Touchpoint’s ”Round about: Stress” workshop we go into more detail with stress mechanisms, and ways to address them with reflexology.